Hamilton's asymmetric models from the 1950's and '60s are some of the most popular and collectible models. 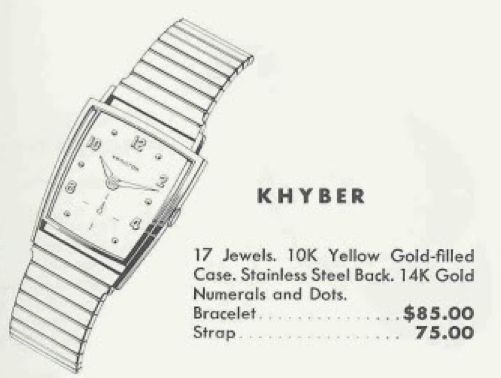 Some watches that sold initially for under $100 can sell for north of $2,000 today. Of course, not all asymmetric models are that expensive but they all seem to command a fair premium, relative to other period watches. One of the more obtainable asymmetric is the 1958 Khyber. It was produced through 1962. 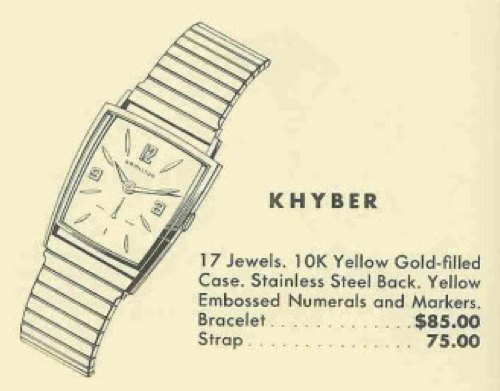 Initially the Khyber was offered with a white dial with embossed numerals and markers. Then, in 1960, the dial was changed to a traditional dial with solid gold markers and numerals. So you'll see two different dial patterns out there and can date the watch relative to the dial it has. Regardless of year, the Khyber comes in a 10K yellow gold-filled keystone-shaped case that is wider at the top than it is at the bottom. Behind the dial you will find Hamitlon's 17 jewel, 8/0 sized, American-made 730 movement. I recently landed a Khyber project watch and a couple of last-second snipers made me pay dearly for it (thanks for nothing - ha ha!). It was very grungy, the crystal was beat up, the dial is spotted and it didn't run - but other than that, it was great! With the bezel removed, you can see the white dial has a lot of spotting. I'm skeptical that it will clean up but it's not horrible either. Maybe just a new crystal will help it's aesthetics. You can tell by the green funk on the right side that this movement is very dirty. The 730 movement won't wind and a little trouble shooting revealed that the winding wheel is frozen by rust. The winding wheel is the smaller wheel next to the crown with the two screws holding it down. Water must have gotten in there and rusted it solid. Fortunately I have a parts movement to donate a new barrel bridge. Since 730's don't have serial numbers, one bridge is as good as another. The back of the dial has some numbers scratched into it indicating that the dial has already been refinished once. So that makes getting it redone an easier decision. A nice looking refinished dial is better than a lousy looking refinished dial. While all the parts are busy being cleaned in the ultrasonic machine, I'll polish the case and install a new glass crystal. Everything gets cleaned, dried, lubricated and reassembled. The now-running watch is running great. All cleaned up and paired with a vintage strap, it's clear that a refinished dial will complete the restoration. Everything else looks and runs fantastic so getting the dial refinished to look like-new is a no-brainer. Here's what the watch looks like after getting the dial redone. Much better now. Don't you agree? Priceless. Otherwise prices may vary based on condition, etc but something in the $400-$500 range isn't unrealistic.